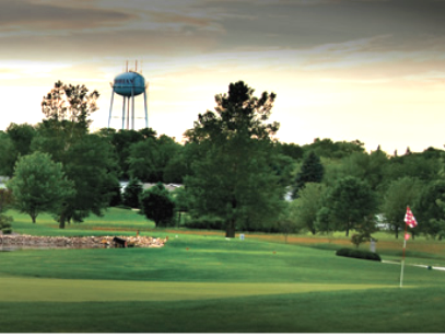 Adrian Golf Course is a Semi-Private 9 hole golf course located in Adrian, Minnesota. Adrian Golf Course opened for play in 1994. 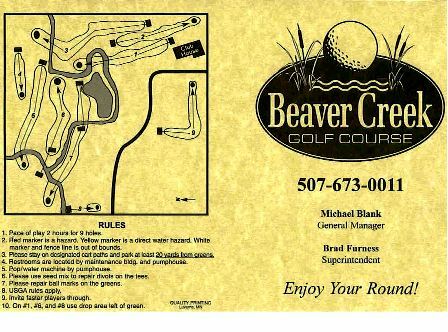 The course was designed by Drew Demarest. This rural community course has fairways which are bordered by mounding. Lateral water hazards come into play on seven holes. All but two holes have dogleg fairways, plus some of the greens are sloped. This is a unique course because of its double tee-box design allowing golfers to play a variety of tee shots and approach shots when playing double loop 18 hole round. Par for the course is 36. From the back tees the course plays to 3,345 yards. From the forward tees the course measures 2,601 yards. The longest hole on the course is # 4, a par-5 that plays to 545 yards. The shortest hole on the course is # 8, a par-3 that plays to 172 yards from the back tees. When playing a double loop 18 holes, the course measures 6,841 yards from the back tees, 6,304 yards from the middle tees, and 5,144 yards from the front tees.